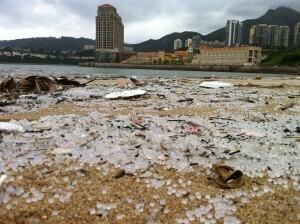 About 150 metric tons of plastic pellets were dumped into the sea when Typhoon Vicente hit Hong Kong on July 23. The pellets, which are also referred to as nurdles, were raw materials designed to make products such as plastic bags, water bottles, and more. Chinese oil and chemical giant Sinopec manufactured the plastic pellets and set aside $1.28 million for the clean up, and stated they will spend more if necessary. Sinopec did not return a PlasticsToday request for comment. During Typhoon Vicente, a container ship lost seven 40-ft containers in the waters south of Hong Kong. Six of the containers contained bags of plastic pellets and one contained glass bottles. Some of the containers were broken causing the plastic pellets to scatter at sea and wash on to nearby beaches. Volunteers, such as Read, have banded together to try and clean up the beaches. Read said they have been working closely with the government and Sinopec to mobilize volunteers and coordinate cleanup efforts. “There was no ‘disaster plan’ for handling this type of spill so it has needed cooperation from all sides to come up with an effective plan to learn everything we needed to know to contain and manage this,” she said. The volunteers are using all sorts of cleanup tools from hand held sieves, dustpan and brushes, rotating sand/pellet sieves, nets and industrial vacuums. “We have been working tirelessly around the clock for much of the last five weeks,” she said. “During this time we have seen thousands of volunteers coming out to the beaches to sift through sand and help remove what we can while it is still accessible.” Read said there will be ongoing cleanup efforts for the next few weeks and monitoring and cleaning as needed over the coming months. While it is difficult to know for sure how much has been retrieved, she said they have estimated they have removed two-third of the pellets, which leaves about 50,000 kg still in the sea and on the beaches. According to some reports, about 60% of pellets have been collected. However, the beaches experienced another typhoon since the initial one, which covered the shoreline again. Some of the concern was the potential threat to food and environmental safety. The pellets may absorb toxins and pollutants, which could potentially pass into the food chain when fish swallow the pellets. Sinopec stated the risk is low because the pellets are chemically stable. Hong Kong has many fish farms and it has been documented that fish have consumed the pellets in significant quantities as the farms were located in some of the worst affected areas, Read said. “The fish are not eating, and they are getting thinner and they will die slowly,” Legislator Wong Yung-kan, who represents the agriculture and fisheries industry, was quoted by Reuters. “We are already seeing the impact in a number of fish farms. We will see more fish deaths,” he said. Read said the long-term concern is the amount of pollution, particularly Persistent Organic Pollutants (POPs), that are present in the seawater there. She said she expects this event will trigger interest in research on marine plastics in Hong Kong, where hopefully they’ll get more answers then. During the clean up, Read uncovered a disturbing discovery. Read, who calls herself an ‘Aussie living in Hong Kong,’ has been involved in marine plastic pollution for the last six years in Hong Kong. She has organized community beach cleanups, which she said has left the seas and beaches more than 25,000 kg cleaner from mostly plastic waste. Read was onboard the Algalita/5Gyres Tsunami Debris Research expedition and one of their goals was to see if they could identify any debris that may have come from the Japanese tsunami in 2011. Beginning in the Marshall Islands on May 1, they investigated the Pacific Garbage Patch, and arrived in Tokyo three weeks later. The expedition ended in Honolulu waters the evening of July 7. They did twice daily surface trawls throughout the voyage for micro plastics as well as data collection from direct observation of floating plastics and other debris. Some of the samples they collected were for other scientists around the globe, which included micro plastics as well as marine organisms and seawater. Read said she is often asked questions about the Pacific Garbage Patch, which is widely referred to as a gyre of marine litter in the central North Pacific Ocean. When she tells people about the expedition and how there is not one huge floating island of trash, to some it is a bit disappointing, she said. “There was no ‘floating island’ of trash as is often portrayed in the media,” she said. “Instead there was a constant flow of plastics past the boat throughout the journey.” After returning from the Pacific Ocean expedition, Read founded Plastic Free Seas, a non-profit organization that focuses on Hong Kong’s plastic pollution problem. Read hopes that one day Hong Kong can be rid of all its plastic debris, which can maybe one day serve as an impetus to implement changes in policy and habits that will result in a positive outcome.